Since the release of the FOUNDATION Fieldbus-support instrument in 1998, Yokogawa has been working hard to improve the efficiency and usability of the field instruments in order to maximize their intelligent functions. Combining the use of the YVP110 advanced valve positioner and ValveNavi has made it possible to tune valves automatically, check the tuning results, and detect deterioration of instruments using the valve diagnostic function. 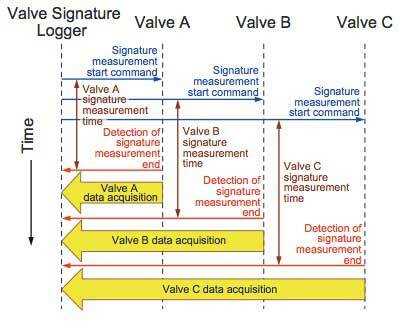 This report introduces the Valve Signature Logger, a new approach to enhance these functions. Latest field devices have not only various self-diagnosis functions but also process-interface-diagnosis functions such as valve diagnosis of valve positioners and impulse line blockage detection of differential pressure transmitters. The YVP valve positioner1 can easily perform initial tuning, parameter adjustment, trend monitoring, and valve diagnosis, by using the ValveNavi YVP management software2. Still, users do not fully enjoy the benefits of field digital technologies. There is a need to reduce operation costs not only for setting, adjustment, and maintenance work but also for monitoring work, minimize opportunity loss due to unexpected downtime, prevent reduced quality due to instrument malfunction, prevent accidents caused by instrument failure, and so forth. To meet these requirements, Yokogawa is developing the Valve Signature Logger which simultaneously measures valve signatures (valve characteristics) of multiple valves. 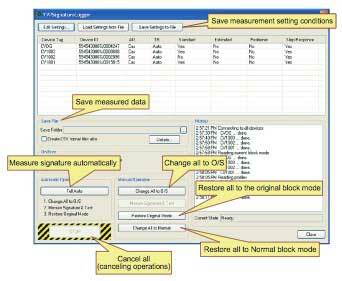 This paper describes the features of the Valve Signature Logger. This section outlines the conventional signature functions of the YVP and ValveNavi, as well as current problems. The maintenance cost for valves accounts for a substantial part of that for field instrumentation. Furthermore, the digitization of valves and related devices lags far behind, so conditions of valves are rarely quantified. 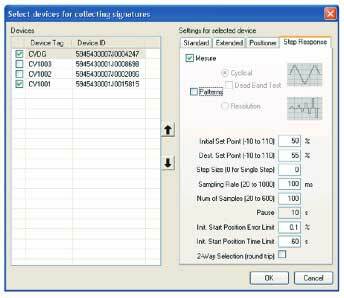 The FOUNDATION Fieldbus has made it easy to acquire objectively measured data on the integrity of valves. The YVP110 advanced valve positioner, which already offered improved controllability, auto-tuning functions, and diagnostic functions with limit switches, was enhanced with signature functions in 2002. These signature functions make it possible to quantify the integrity of valves multifacetedly. Signatures available in the YVP110 are as follows. The YVP has a small pressure sensor. 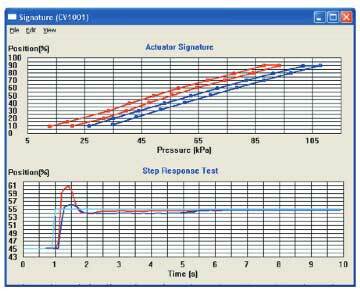 The actuator signature is a characteristic curve which shows the relation between the actuator pressure input from a YVP and valve position when the valve position is changed scanning the YVP air pressure output. It shows the combined characteristics of valves and actuators. There are two actuator signatures: standard and extended. The standard actuator signature is used to outline the characteristics by measuring the pressure with the valve position incremented by 10% from 10% to 90% and decremented by 10% from 90% to 10% of the span. The extended actuator signature is used for more detailed investigations. 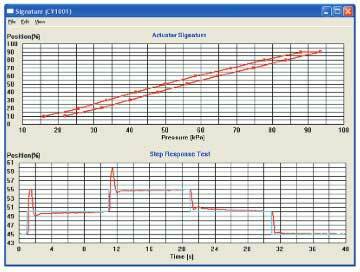 The step response is a characteristic curve which shows the relation of time versus valve position with stepwise setpoint input, or the response waveform which represents the overall characteristics of the valve, actuator, and positioner. The positioner signature is the input-output characteristics of the valve position corresponding to the setpoint, or overall input-output characteristics of the valve, actuator, and positioner. Each signature data can show various states around the valve, but it is more effective to use the ValveNavi for visual understanding, calculation of evaluation values, comparison with past data, and so forth. The ValveNavi is a software package which runs on a PC, stand-alone or as a plug-in of the Plant Resource Manager (PRM)3. It performs initial adjustment, parameter configuration, trend monitoring, and valve diagnosis of the YVP. Various functions of the YVP can be performed by directly setting its parameters, but the ValveNavi makes it easier to do this, and more correctly. In fact, it is extremely troublesome for users to display the results of signature functions without using the ValveNavi. The signature functions of the ValveNavi are outlined below. The step response test in the YVP signature function is a single step procedure with the start and end points specified. The ValveNavi can conduct the multi-step response test, where measurements are carried out following various setpoint patterns based on the standard of the Instrument Society of America (ISA). Signature data measured and acquired by using signature functions of the YVP and ValveNavi can be graphically displayed. Figure 1 shows examples of a standard actuator signature and multi-step response displays. The ValveNavi can calculate and display various evaluation values based on measurement results. For example, as shown in Figure 2, spring range (valve operable pressure range) and valve friction (half of the hysteresis width) can be displayed in the standard actuator signature, and overshoot and 86% response time of the first step can be displayed in the step response. As shown in Figure 3, the Valve Signature Logger can superimpose old signatures, which are saved during the startup of the plant or various maintenance sessions, on the current signature. This makes it possible to grasp the deterioration of valves. Although the shapes or changes of images cannot be utilized yet to automatically judge deterioration, this provides the information required by operators to intuitively evaluate the signature. There are two main usages of signature functions: one is for confirming the results of automatic or manual valve tuning, and the other is for confirming the deterioration of valve parts during maintenance. In particular in the latter usage, disassemblies and checks carried out during preventive maintenance merely confirm that most parts are normal, and much of the work involved is unnecessary. Functions reducing such unnecessary costs is required. In contrast, the ValveNavi is a software application developed for tuning, various settings, and signature measurement for a specific valve, and so it is not suitable for the latter usage because the measurement of signatures must be repeated for multiple valves. To solve these problems, we have developed a prototype of the Valve Signature Logger which simultaneously measures multiple valve signatures. We concluded that the following functions are essential, and implemented them in the prototype. This section describes the reasons for our decision and how we achieved the functions. Although the ValveNavi runs not only on the PRM but also on stand-alone PCs, it is sufficient for the Valve Signature Logger to operate only on the PRM which manages information of all valves because the purpose of the logger is to simultaneously measure multiple valve signatures. Running on the PRM, it immediately lists the valves managed by the PRM and prepares for settings for measuring signatures, as shown in Figure 4. During the signature measurement, communication on the FOUNDATION Fieldbus is used only for checking the progress of the signature measurement, and this measurement time is generally longer than the subsequent data acquisition time through the FOUNDATION Fieldbus. Accordingly, simultaneous signature measurement (i.e., simultaneous valve operation) substantially reduces the total waiting time for measuring and acquiring the valve signatures rather than repeating signature measurement and data acquisition for each valve. To avoid excessive communication load, data acquisition is conducted sequentially for the valves with signature measurement completed. Figure 5 shows the simultaneous signature measurement. The signature measurement is an offline diagnosis because valves are actually operated from 0% to 100%. Accordingly, the signature measurement can be started only after the block mode of the function block is changed to O/S (out of service). Before starting the signature function, maintenance staff must let operators know about the execution of the offline diagnosis of the concerned valves and receive their permission to proceed. When measuring signatures of multiple valves, we believe that changing all block modes to O/S simultaneously by notifying beforehand would be more useful than alerts on mode change for respective valves which may annoy some operators. Therefore, we implemented the functions of "change all to O/S," "restore all to the original block mode," and "restore all to Normal block mode." To reduce workload, it is desirable to measure the signatures of multiple valves automatically and simultaneously. This function is supposed to be utilized after ensuring the safety of the plant, for example, during large-scale maintenance with the plant operation suspended. Maintenance staff could utilize this function to set up automatic signature measurement and acquisition at the end of the day and confirm the results the next morning. In this case, the logger would automatically perform the following procedures: changing all block modes to O/S simultaneously, starting the signature function of all valves and acquiring data from those with the measurement completed, detecting the completion of signature acquisition for all valves and restoring the block mode to the original mode simultaneously. In the prototype, the ValveNavi performs the tasks of displaying measured data, calculating evaluation values, etc. Accordingly, the data is saved in ValveNavi format. Meanwhile, maintenance staff may use measured data for creating inspection reports on many valves, so the logger also supports the comma separated value (CSV) format. Signature data are measured for maintenance. To easily compare them with the previous data, settings can be saved, including identification information on target valves and detailed parameters for signature measurement. Valves may have been replaced or added since the last maintenance. In these cases, users can read the saved conditions and compare them with the registered instrument information in the PRM, and if necessary, can change and save them. Valves sometimes operate quickly, such as when the block mode is restored from O/S to AUTO. Although the logger does not have an emergency stop function for safety purpose, it has a cancellation function which can cancel all operations simultaneously. It is possible to stop the signature measurement when error in a notification to an operator is recognized or restart the measurement when incorrect settings are detected during the measurement. This function can cancel measuring the signature and changing the block mode. This cancellation procedure follows the policy that the cancellation fundamentally only stops the operation as it is and does not return to the original state because, for example, returning block mode to AUTO would result in valve moving. Figure 6 shows the display upon starting up the Valve Signature Logger prototype in which functions described above are implemented. This report introduced a prototype of the Valve Signature Logger under development. Some users have been trying it and providing good feedback and valuable comments. Based on their feedback and comments and our studies on maintenance works, we have already identified issues to be resolved. For example, we must consider safety procedures to be taken by operators while diagnosing moving valves and how they should be supported in the system. We will improve the functions of the logger based on these issues and continue to make effective use of field digital technologies, including the development of solutions for effectively utilizing field digital technologies. YVP, ValveNavi, and PRM are registered trademarks of Yokogawa Electric Corporation.